Searching for an easy to implement, feature rich, yet cost-effective eCommerce storefront software solution? You've come to the right place! Most of the eCommerce storefront software solutions today seem to end up a compromise. If feature rich, they invariably are difficult and costly to implement. If they are easy to implement, it seems they lack many essential features. KommerceServer webStoreFront is different, it's a no-compromise eCommerce storefront solution, delivering all the features you need while remaining easy to implement and cost-effective. New! KommerceServer Release 5.6 is now available, contact Kore to see a product demonstration. 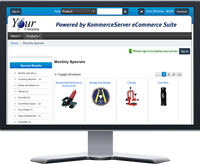 The KommerceServer webStoreFront provides a powerful eCommerce storefront that is designed for manufacturers, distributors and retailers with effective support for both business-to-business (B2B) and business-to-consumer (B2C) environment. Expand your market reach, boost online sales and compete more effectively in the global market while you connect with customers and collaborate with partners. webStoreFront includes significant out-of-the-box functionality with an easy-to-use interface that allows for customization of product content, taxonomy, advanced search, and more--without requiring code changes. All the necessary software and services are included and we guarantee the implementation. Replace your Web site or integrate with your existing site. The software is configurable and can be customized if needed, plus you can tailor the look and feel to meet your needs. A modern corporate website will enhance your ability to sell online, make it easy for your customers to do business with you and streamline your operations thereby saving you money. KommerceServer is Mobile ready out-of-the-box. Get the power of the webStoreFront in a compact mobile solution with a streamlined, responsive interface that is designed for the requirements and workflow of the mobile user. A perfect complement to your corporate website. KommerceServer webStoreFront has the enterprise class features you need for Business-to-Business and Business-to-Consumer environments. 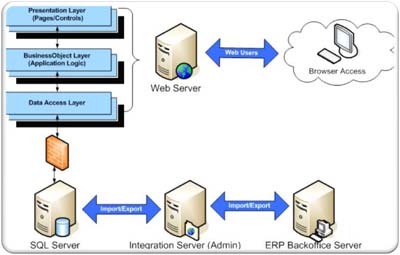 For additional capabilities you can add the optional enterprise customer information portal to your eCommerce solution with KommerceServer webPortal. This provides your customers with the convenience of 24/7 self-service capability so they can quickly and easily track in-transit shipments, view their current orders, see their order history, easily reorder products, and more. 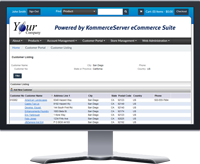 KommerceServer webStoreFront is designed for integration with a back office system. This integration provides key information for the webStoreFront such as: customers, parts, prices, inventory, etc. eCommerce storefront software and Web portal solutions that extend your enterprise over the Internet, allowing you to connect with customers, collaborate with partners, and compete more effectively in the global market! KommerceServer webStoreFront. Exceptional eCommerce storefront software that is feature rich, easy to implement, and cost-effective. So what are you waiting for? !